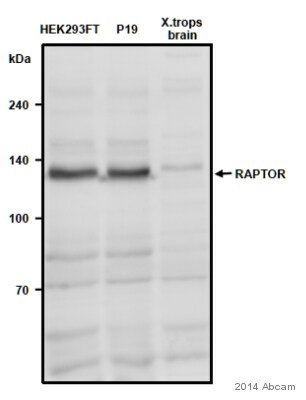 ab25975 recognises Raptor(regulatory associated protein of TOR). Synthetic peptide (Mouse) - a 16 amino acid peptide from near the carboxy-terminus of mouse Raptor. Our Abpromise guarantee covers the use of ab25975 in the following tested applications. WB Use a concentration of 2 µg/ml. Predicted molecular weight: 149 kDa. 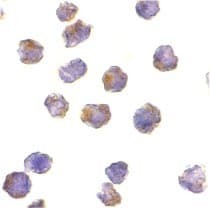 All lanes : L1210 cell lysate. ab25975 has not yet been referenced specifically in any publications. Publishing research using ab25975? Please let us know so that we can cite the reference in this datasheet.